Heat Pumps: The Best HVAC System for SoCal Homeowners? Can Air Filtration Fight the Cold and Flu? We are now in the midst of cold and flu season, so what can we do to lessen the risk of illness? Did you know proper air filtration can lessen the severity of symptoms caused by a cold or flu? It’s true; the quality of the air you breathe has a significant effect on the severity of your symptoms and affects the number of times you get sick per year. Air filtration and air purification systems are used to remove a different range of contaminants from indoor air. In fact, air purifiers are especially important for those with weakened immune systems. 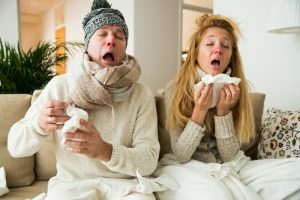 The average American adult will get two to four colds per year, and children will get about six to eight colds per year. Of course, we all know certain ways to prevent ourselves from getting sick, like washing our hands and keeping distance between ourselves and someone who already has a cold. However, breathing clean air is another preventative measure that we often overlook. In this blog, we will explain the difference between air filtration systems and air purifiers, and why they both matter. Airborne contaminants can have a wide range of negative effects on both health and comfort. Air filtration systems can remove those contaminants from indoor air as the air conditioner, heater, or fan is running. An air filtration system contains a fibrous filter designed to capture contaminants that encounter it. A standard residential filter can remove most common indoor contaminants from the air, such as pollen and pet dander. The air filter in your HVAC system is not there to protect you, it is really meant to protect the HVAC system itself from pollutant build-up. However, designated air filtration systems are available to boost air quality throughout the house! Remember, it is important that the air filter is changed regularly. A clean filter will protect your HVAC system and prevent allergens and irritants from circulating through the air. Regular maintenance is an important step in making sure your HVAC system works efficiently and effectively. Greenleaf Heating and Cooling installs and maintains air filtration systems in Whittier, CA. An air purifier can be installed inside the HVAC system in order to treat all of the air that flows through the ducts. Air purifiers are meant to keep your air clean and your body healthy. UV Air Purifier: Promotes health by killing off bio infectious organisms in indoor air by giving off UV light, which kills germs and mold. Electronic Air Purifier: Gives pollutants a static charge through ionization. The pollutants are trapped on collector plates that can be washed. Remember, air purifiers may require some maintenance, too. It is important to have an HVAC technician make sure everything is running smoothly to keep you and your family germ-free this cold and flu season. Contact Greenleaf Heating and Cooling to fight the cold and flu!